On May 18, Tokyo Crusaders held an Awards Dinner at Nogi Kaikan with some 60 attendants – players, families and guests. Thanks to everyone for making this season a tremendous success! Don’t miss Team Manager, Stewart Henwood’s speech here below. I had no intention of making a comeback. Goodness knows, I’ve already retired twice,…but around this time last year, I started to get the feeling that I should help out. I’m glad I did, it’s been a blast. I do realise that I was a bit ‘Bolshy’ at the begining; sometimes you have to break a system to repair it. And I’m sure on that first day back in September most of you were wondering who this ‘old git’ was. Well, I’m one of the group of four guys who formed this team 23 years ago. (Do you know, we didn’t even have e-mail back then). I’m not a coach. Hell, I’m not even a good player,…anymore. I just love my club and I love this club. I’m also certain that some of you were wondering where I was going with certain things at times…… however, I am always firm in my belief that there is a method in my madness. I would like to thank the committee for having faith in me. Gareth, for his behind the scenes work. Evan, for being the driving, rugby guy that he is. And Jonas, for the amount of work he has done on his computer. Also, mention must be made of Roy, for his work with sponsorship and the kit. And finally, I’d like to thank you all for coming along for the ride, especially the so-called ‘Navy guys’ whom I consider to be nothing other than valuable members of the Cru. I have spent the year trying to build relationships with teams. It is imposible for us to survive as a club playing only ‘foreign’ teams. We must build and maintain relationships with Japanese Clubs. And we have met some great teams who are more than happy to have another crack at us next season. It is a work in progress, though, testament to which are the few teams who flatly refused to play us this season. We play two types of games: a tournament game, and a practice game. A tournament game is where we need to win; we play hard and physical rugby. A practice game is where want to win, but we train up new players, we try new things, and we build a relationship with the opposition. I have also spent the year trying to build a team spirit. On the field, that is done by encouraging each other, and giving a pat on the back when it is deserved. Teaching when necessary, coaxing and cajoling, but never abusing. We cannot all be good at everything. Each player has his faults. But we all come together, we work together, we form a team, we form a club. However, having said that, I do apologise for some of my sideline tirades,… sometimes I think I’m the the Boss. The after-match Izakaya at the nearest station was reintroduced, and I feel that ￥3,000 for two hours of food and beer is not too much of a price to pay for keeping everyone together, and in good spirits. Speaking of good spirits, we have had a fairly incident-free year. To the best of my knowledge, no-one has been thrown off a train or created a scandal with the police on game day. Or just perhaps, as always, I’m the last to know. Gamewise, we have done so much more than I expected. 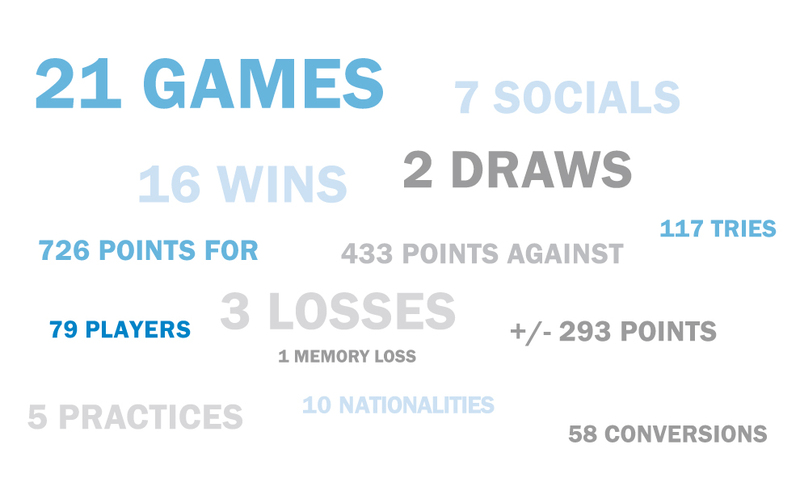 We have a record of 21 games, 2 draws, 3 losses, and 16 wins. We have scored 726 points for and conceded only 433. We have relearned how to win and keep on winning. There is no greater satisfaction than coming from behind to pull off a win. But more importantly, we have been promoted to the first division for next season. My only goal for next season is to finish in the top three of that division. We have won most of our games this season, but next season we will be taking a step up. A step up means stronger opposition, and the need to put out a more ‘consistent’ team. Speaking of which, it looks like I have been railroaded into dragging you guys through another season. I think I can just squeeze in one more year before the imminent onset of alzheimer’s. Before I throw myself off the stage and start planning for next year, I have a duty to perform. It is an honour to give this award. It is for the player who has most consistently turned up for the team regardless of whether it was a game, a practice, a meeting, or a social. A player who some teams call a stalwart. We call him the CRU IRONMAN! Come on up Mr. Alex Diaz …..